18th May 2010 Added the May Meeting report. 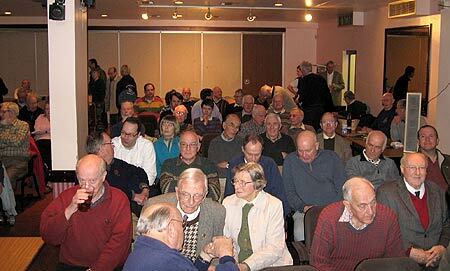 "World War II Wireless Intercept and Secret Stations"
Stan described the development of the network of secret wireless stations that intercepted enemy transmissions during WWII and subsequently decrypted at Bletchley Park. Photograph Stan presenting his illustrated talk. The story began with a Post Office radio station at St Albans that was secretly reporting German wireless traffic to the Foreign Office in 1932. 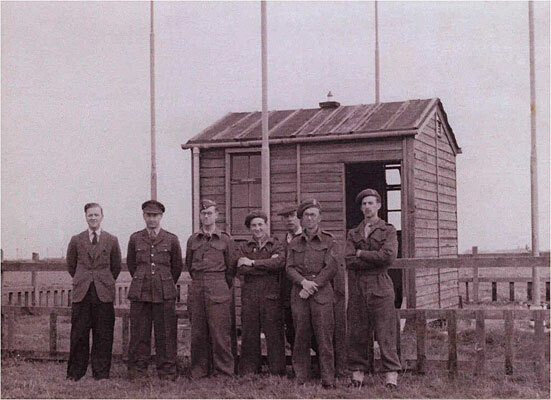 By the end of 1938, the military authorities asked the Post Office to set up a network of eavesdropping stations – the first of which was built at Sandridge near St Albans. The work of Bletchley Park is well understood but little is understood about the how the raw intelligence was collected. 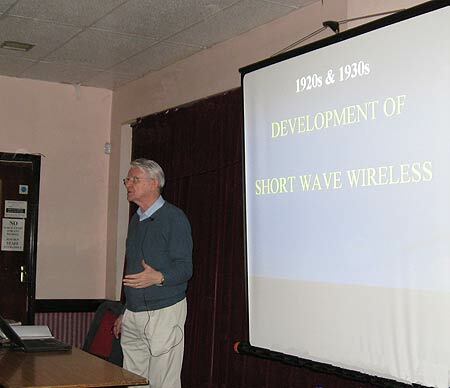 This presentation described the growth of wireless intelligence in WWII and the networks of secret wireless intercept stations and direction finding stations around Britain. The three Armed services each built their own networks but more secret still were those operated by the Foreign Office and MI5 & MI6 who successfully tapped directly into the highest levels of German Secret Service communications. 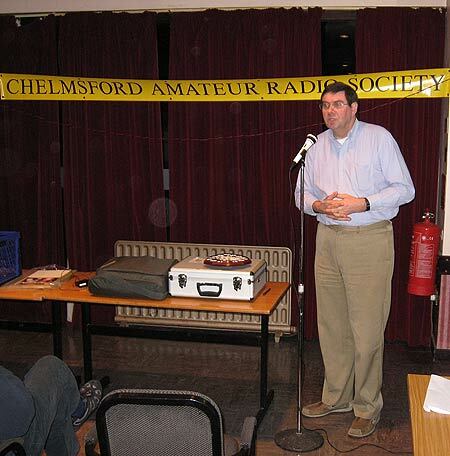 Radio amateurs played an important role in this work and a number of key installations in and around Chelmsford also played an important role. 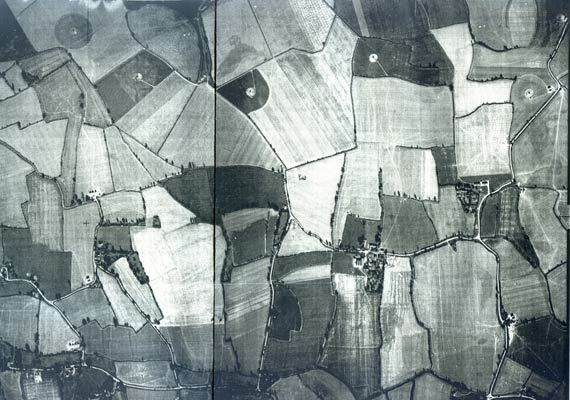 Photograph of the 5 Monitoring Stations at Ford End - from the air, 1946. Photograph by permission of Essex County Council, Historic Environment Record Office, Chelmsford. Stan's research had found that a Naval Report into the location of German U-Boats improved when a 5 position DF station each took a track of the submarine and the average was then taken. This accounted for the fact that the 2 position DF stations were made into 5 position ones in 1944. The grass circles around each station were cut to enable an operator to move a Marconi calibration transmitter from each of 36 white pegs in turn. These had been driven into the ground around the perimeter of the circle to enable the station to be calibrated. During the Cold War these stations were used to plot Russian submarines until 1972 when they were removed. Look today at the same area - can you see anything which remains? A historic photograph has come to light which shows very clearly the make-up of a HF DF Station. 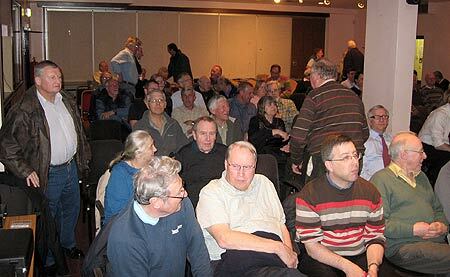 This one also has a CARS Founding Member, Louis Varney, G5RV as a Captain in the Royal Signals. Bell Warrington (French mother, family spoke French. Entertained a Capt De Gaul on visit c.1943). 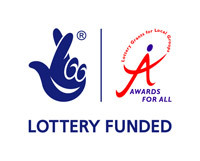 Thanks to John McCafferty for use of the picture. The meeting was very well supported with over 110 persons packing the large room at MASC - possibly the largest audience in the history of CARS. At question time during the break, a number of residents from Ford End and Pleshey provided Stan with additional information regarding the 5 position DF Stations. Mr Dave Bolwell, ex G3JCM and Colin Page, G0TRM informed Stan that they had both worked at the site of a DF Station at Bedells End, near Writtle in the early 1960s while testing Marconi equipment: Dave on Radar and Colin on DF. The DF Station was by then closed but the destinctive wooden hut was still there which supported the aerial system. Thank you Stan for presenting a very interesting and informative talk in such a manner that technically minded persons were able to get something from it as so were persons who simply wanted to follow the secret story. Stan, on reaching home after the event thanked CARS for their involvement and commented on the good turn-out. Later, David Powis, G4HUP said that he was connected with the GB75 Special Event Stations from Bawdsey Manor, near Felixstowe and that they were going to transmit again on the 5/6th June. "Breathing new life into an old Marconi T1154, R1155 and CR150". After the announcements Chairman John introduced our speaker for the evening, Club Member Peter Bridgeman G3SUY to a well attended meeting with a goodly number of visitors. Not surprising really, when many amateurs either used the 1154/1155s or had one or other of them in the past. A nostalgia trip for many of us! Restoring old equipment is one of those bugs that once caught is difficult to cure. There are two types of restorer. Those who restore to the original condition in every detail using authentic materials and components so that the result is like new! Then there are the other breed of restorers, who take a more pragmatic view and tend to use modern components and are not averse to making the odd modification to improve performance, but still preserving the main essence of the equipment. Peter is obviously one of these! The 1154/1155 equipments were developed at Writtle around 1939 and entered service in 1940, replacing the 1082/1083 and 1115/1116s, and remained in front line use until the 1950s, lingering on for twenty years with Cadet use. They proved very versatile, being used in a variety of applications and with total production of about 80,000 by various manufacturers. They were intended for CW, MCW and phone with RDF facilities in the receiver. Peter's T1154 was rescued from a farm near Manchester in a very deplorable state, and presented a challenge! With considerable dedication, mechanical and technical expertise, he has restored the T1154 to excellent working condition! Peter follows a logical procedure in his restoration work and much of the wiring was replaced together with some of the high voltage capacitors. First switching on is done in easy stages, filaments first and then with reduced HT. The suppressor grid modulation circuit was modified with provision for fixed bias and has proved very satisfactory. We were shown a picture of the modulation waveform which was excellent and it was generally agreed that the resulting AM sound was easier on the ear than AM from modern transmitter rigs. Could this be due to the wider transmitted bandwidth of the 1154? Who knows, but it was agreed that the sound recordings taken of the 1154 were impressive during the CARS Top Band Net the previous week. The PT15 output valves were tested in a rig Peter had devised and several photos of flash over in the valves illustrated various faults. So much for the 1154. The Marconi 1155 Receiver is a conventional superhet with the addition of valves and circuitry for the RDF facilities. The IF chosen was 560 kc/s right on top of Athlone, necessitating efficient rejector circuits. A loop is provided for DF and a another fixed aerial is used for sensing. A trailing wire aerial was used for the lower frequencies. As with the transmitter, much rewiring was necessary due to the perished rubber. Peter has constructed a control unit to enable the two equipments to be used together and this includes higher stability frequency sources for the TX. Now to his Peter's CR150. This is of special interest to me because in my youth I was involved with the development of the CR150/4 which was used in double diversity equipments such as the CRD 150. His rejuvenated CR150 was in a pretty deplorable state and required a complete rewire and replacement of many paper capacitors, including those three in a can types used in the IF stages. He replaced the four EF50s with miniature 7 pin valves culled from a Pye PMR set. He rebuilt the coil pack for amateur use covering the lower frequency bands, quite a task! A modern product detector and amplified AGC were also slipped in! Whereas renewing the inside of old equipment is relative straight forward, the outside appearance can present problems, particularly labelling. Peter overcame this using a PC with Word and a drawing program. The CR150 case was repainted using a number of cans of Ford retouch paint with excellent results. Peter told me that he is always reluctant to give this talk because he knows his voice is going to give out towards the end! However it started to flag but in spite of that it gave us all a very interesting evening, illustrated with many excellent slides and pictures of his remarkable achievements, driven on by unflagging enthusiasm for the tasks in hand. I have to admit that the word nutter comes to mind but I do wish I had his patience and dedication! Thank you Peter, we all enjoyed your talk, and thank you for lending me your memory stick so that I have been able to enjoy your photos and comments one more time!